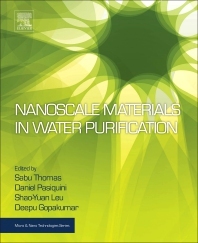 Novel nanoscale materials are now an essential part of meeting the current and future needs for clean water, and are at the heart of the development of novel technologies to desalinate water. The unique properties of nanomaterials and their convergence with current treatment technologies present great opportunities to revolutionize water and wastewater treatment. Nanoscale Materials for Water Purification brings together sustainable solutions using novel nanomaterials to alleviate the physical effects of water scarcity. Daniel Pasquini is an Associate Professor and Researcher at the Chemistry Institute of the Federal University of Uberlândia, Uberlândia-MG, Brazil. He has edited 7 books, and published more than 25 publications in indexed journals, 12 book chapters and more than 85 works in conferences. His research interests include: polymers from renewable sources, vegetal macromolecules; cellulosic fibers; composites; nanocellulose and nanocomposites. Institute of the Federal University of Uberlândia, Uberlândia-MG, Brazil. Shao-Yuan (Ben) Leu is Assistant Professor in the Department of Civil and Environmental Engineering at Hong Kong Polytechnic University, Hong Kong. His research focuses on the treatment of waste water. Deepu A. Gopakumar works as Post-doctoral fellow at School of Industrial Technology, Universiti Sains Malaysia, Penang, Malaysia. His research focuses on nanocellulose-based polymer membranes for water treatment.